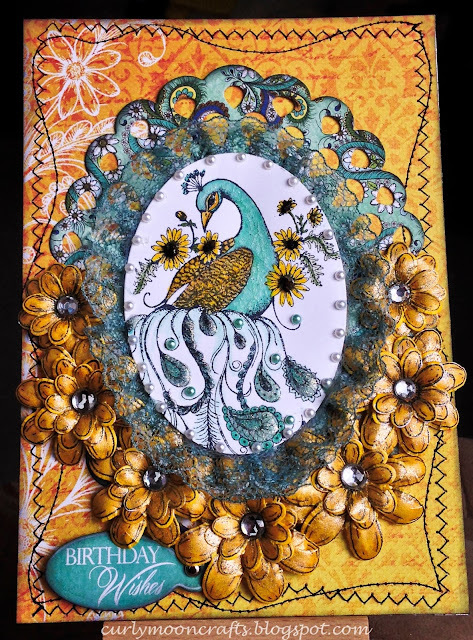 Hi Friends: Today's post is a birthday card using stamps and papers from Heartfelt Creations - love their products. This lovely peacock makes me think of warmer climates and bright sunny days - we had some lovely days last week, then snow flurries on Saturday - gotta love the weather in the Midwest! Hope you enjoy this card - it was lots of fun to make! Have a super day! Stamp Feathery Peacock stamp onto white cardstock using Memento black ink and color using alcohol markers, add glitter pen to body and wings. Die cut peacock with oval die. Add Glossy Accents to tail feathers and sprinkle with Ultrafine Glitter. Add crazing medium to body and wings to create dimension on the peacock. Add Earth Elements to center of flowers around the peacock. Color the lace with the turquoise alcohol markers and glue to underside of the oval. Stamp Delightful Daisy onto white cardstock using Memento black ink, color with alcohol markers and gold 3-D stamp paint, then cut out using coordinating die. Shape flowers using the Flower Shaping tools, layer and add gems to the centers. Cut Peacock Paisley paper to fit A7 card base, edge with black ink, add texture with sewing machine, then glue to card base. Use die to cut scallop oval from paper pack, edge with black ink, and adhere to card center. Adhere peacock oval panel to center with foam dots and arrange flowers around the bottom. Add pearl gems around oval and on tail – color tail pearls with turquoise alcohol markers. To finish, use Luggage and Tags die to cut sentiment from the paper pack, ink edges, add brad, and adhere to card with foam dots.